The switch can detect infrared from the human body, and use the infrared to control the charge. You can conveniently to let the auto light on and off. Adjust soft and stable light, no flickering. Can detect infrared from the human body. 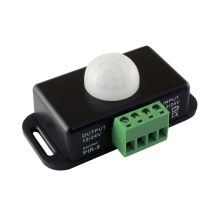 Mainly use to control LED light and LED strip lamps. Applicable for incandescent lamp, energy-saving lamps, LED lamp, fluorescent lamp and other types of charges.